It is a truth universally acknowledged that an alien army, on invading Planet Earth, will always head for New York City, Los Angeles or Washington DC. But not this time! For a change, the target has been identified as Sydney, Australia, and a small town not too far away. 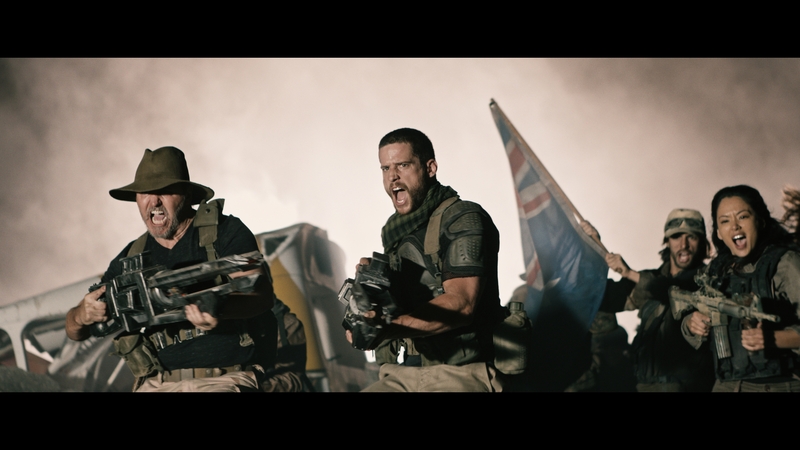 It’s unusual to see Australia as the centre of such a movie, largely due to the funding required for the large-scale special effects demanded by alien spaceships, technology and costumes, and for that reason it’s a great that director Luke Sparke was able to get enough local funding to support the film and get Sydney on the screen here. And so while the location makes for some spectacular scenes of the destruction around Sydney Harbour Bridge and the Sydney Opera House at the beginning and end of the movie, the rest of the story unfortunately has little original to offer. There’s the odd rousing speech, a literal flag being waved, and some extremely unnecessary slow-motion running towards the camera. The film has the usual tropes that you would expect from an alien invasion – a ragtag bunch of characters who would normally never spend time together, some hiding secrets, must team up if they are to survive. Each of them coincidentally has some type of skill which will be useful to the group. A leader emerges. There is infighting. The movie plays it very safe and you can virtually guess who is going to survive by the end once you’ve met them all. Probably the name that stands out in the cast list for most viewers will be Temuera Morrison (Once Were Warriors, Star Wars: Episode II – Attack of the Clones, Aquaman) but unfortunately he’s given little of interest to do beyond play a stereotypical ex-con. Of course unwanted extraterrestrial visitors to domestic shores always hint at real life issues of immigration and the acceptance of migrants, and whereas the best movies use this with subtlety, the ending here is very heavy handed – although to be fair, well-intentioned. And I don’t care what anyone says – after a year of being forced to work in the fields, I maintain you would not still be wearing a full face of expertly applied make up, no matter what the context. Occupation will keep you occupied (sorry!) for a couple of hours, but beyond the setting, it’s nothing particularly new.